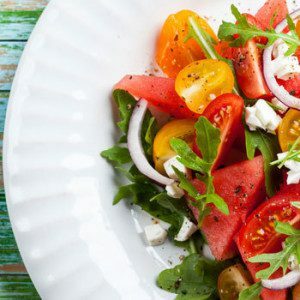 Sweet watermelon and savory heirloom tomatoes are a perfect pair and make a delicious, healthy summer salad. Choose tomatoes of several different colors for dramatic appeal. Combine oil, vinegar, basil, salt, and pepper in small bowl; whisk to blend. Set aside. Arrange arugula, watermelon, heirloom tomatoes, cherry tomatoes, and onion on a large serving platter.